Every night at 12:18 a.m., like clockwork, my daughter would wake up crying to be fed. Even though she soundly feel asleep at 8:30 p.m, those 12:18 a.m. feedings were becoming way too routine. I was desperate to find a way to help her (and me!) sleep through the night. That’s when a friend told me about the idea of a dream feed. Dream feeding was a new concept for me. I hadn’t heard the term before, but i was definitely open to trying new ways to promote sleep. The idea behind it made a lot of sense, and, after about doing it consistently for a week, those 12:18 a.m. feedings soon subsided and we were both waking up around 6:00 a.m. Dream feeding was a lifesaver! A dream feed is basically what it sounds like—you feed your baby while they are still asleep by gently rousing them enough to feed or nurse in order to reduce middle of the night wakings and feedings. Usually, you can do a dream feed some time between 10 p.m. and midnight. You can choose a time of the dream feed based on when you go to bed and what seems to work best for your baby. The idea is that if you feed your baby—without fully waking them—before you go to bed, they will be full enough to sleep for a longer stretch at night and/or until the early morning, which means that you can potentially avoid a 2:30 or 3:30 a.m wake up! First, rouse your baby without fully waking them up. Your baby will need to be alert enough to take your breast or a bottle, but you should be extra careful not to fully wake them, which can lead to a cranky baby and throw the whole night off. For some babies, all you may need to do to stir them is gently take them out of the crib and position them to feed. Then feed your baby. Continue on like you would a normal feeding. If you’re breastfeeding, get your baby to latch on to start sucking. If you’re bottle feeding, you can usually wiggle the bottle into your baby’s mouth to initiate suckling. If you’re having trouble getting them to take the breast or bottle, they’re probably aren’t awake enough. If your baby is too drowsy and won’t eat during the dream feed. If those don’t work, put your baby back down. You can try again a little while later on, if you’re still up. If it doesn’t work, don’t force it. You don’t want to run the risk of having a cranky baby all night because you accidentally woke them up. If you try without success for a few nights, stop for a couple weeks and then try again. 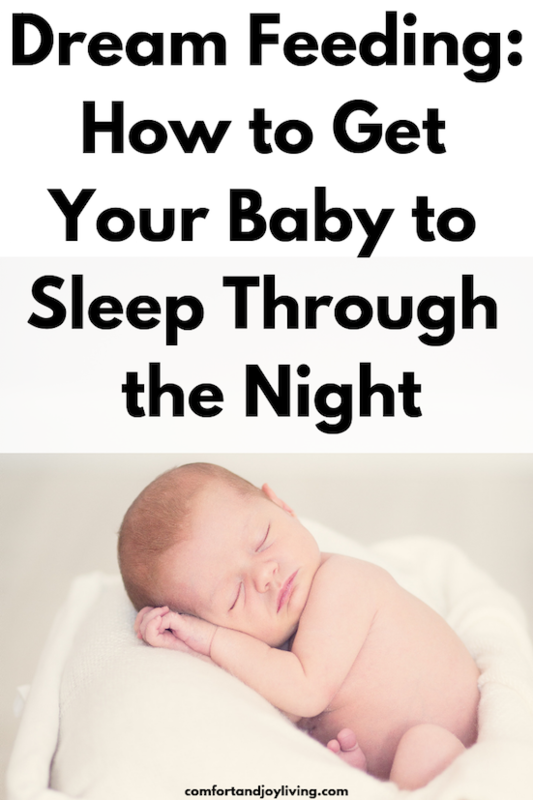 Here are some tips to keep your baby sleepy and ready to go right back to sleep. Keep the room dark and quiet. I used a small nightlight in the room. If you swaddled your baby, keep them swaddled. Try not to make eye contact. After feeding your baby, place them back in their crib or bassinet. Some babies will continue to wake up in the middle of the night—especially when you first start dream feeding—but with consistency, your baby may start sleeping through the night. The idea is that you’re filling your baby up with nutrients to help keep her full throughout the night. Not only does dream feeding put you in control of the feeding, it also keeps your little one “satisfied” throughout the night. When their belly is full during those early morning hours, their less likely to wake up hungry and crying. That means that you might both get a good night’s rest. The goal with dream feeding is to help your baby sleep from the time you go to bed through until the morning. All babies are different, so there’s no specific age recommendation. My advice would be to stop dream feeding a month after your baby is sleeping consistently well from the time of your dream feed on through to the morning. Will Dream Feeding Work for My Baby? There’s a good chance that with consistent dream feeding, your baby will sleep for longer stretches of time at night. Just keep in mind that your child’s needs and patters may not be exactly like others’. If you’re interested in dream feeding and want to give it a try, I encourage you to do so I hope it works for you as well as it did for us! Have you tried dream feeding with your baby? Let me know how it worked out and any tips that you can add in the comments below. Hello, I’m Kelly, a regular contributor on this blog. I live in Pennsylvania with my loving husband and our five beautiful children. I have a background in early childhood education, but I am currently homeschooling my kids. From pregnancy to postpartum to toddler life, I love sharing advice with other moms who are having a challenging time with this crazy but wonderful role of motherhood. Copyright 2019. Simply Creative Publishing, LLC. All Rights Reserved.